Pulling from my creative well when I'm painting or creating with any of the other art forms I do seems to be much easier when I remember to fill that well. Drawing is one of those things I do for myself. I like to explore both the mediums and the image. Regardless of how many times I've looked at something or made a drawing of something, each time, there is something new I discover. Chili peppers from the plant growing in my bedroom window are in a shape that reminds me of a hand. I didn't consciously draw them that way, but I've been spending some time drawing the human hand skeleton (at the local college science lab), so I'm not surprised to see that influence in this charcoal drawing. The goose foot was a gift from my friend, Terry Scoville. She's a hunter who shoots only for food. She seems to use everything when she harvests an animal. The foot was shockingly beautiful. It looks so much like a water plant. Terry told me about the circulatory system in the birds feet. What amazing structures. 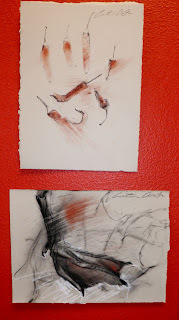 This past year I reconnected with an old friend, Tolley Marney and learned that during the years we'd lost touch, he'd become an artist. He's a cowboy and farrier who's turned his lifetime love of the cowboy life and horses into a passion for creating gorgeous sculptures of the American western horse. True to his roots, he sometimes incorporates used horseshoes from his shoeing work into his western horse sculptures. "Art is a constant – it never leaves my mind. I don’t think about creativity as much as I always feel its presence blooming and developing into something new. I create horse sculptures because I’ve interacted with horses all of my life, so I understand the horse and feel a comfort working with its image. The horse is a kindred spirit. Horses are creatures that will do anything in the world for us as long as we ask in the right way. Heart and soul, they always amaze me. The horse is a reflection of our actions. They are pure and don’t lie. They tell us when we are doing something right and when we aren’t. The process of creating each sculpture has the same truth. . . READ MORE"
I get attached to things -- not necessarily valuable material things (though sometimes they are), more often a beautiful bone or an old battered box that used to sit on my late grandmother's dresser is what catches my attention. This January I've been inspired to finish organizing my Abuelita's (Grandmother's) family photos. I narrowed the pile down to about 500 photos that span about 100 years. It's been an ongoing project that I've dipped in and out of for several years. I took the junky old button boxes and battered jewelry boxes that were part of the pile and remade them with collages of my drawings, monoprints and images of my paintings. Here's a photo of my finished group of work. 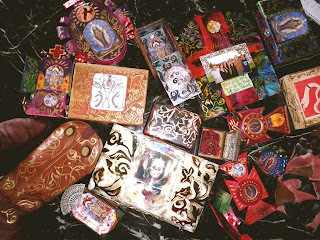 It also includes a pair of painted cowboy boots and some candy tins I made into mini-retablos for my house.